Living Pool Church is proud to be a sponsor of Grace Betherl Ministries. God had a plan upon the family of Grace Bethel Ministries. 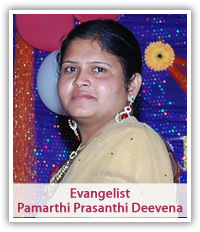 I am an evangelist Prasanthi Deevena, I came from a Hindu family. My grand parents were pastors since I was 15 years of age. My whole family accepted our Lord and Saviour Jesus Christ. My childhood God gave me a vision to do His ministry, from that time on I dedicated my life to His service.